The Galloway Cattle Society is looking for two young people to send on a once in a lifetime learning journey to Australia. The opportunity is a trip to the Galloway World Congress, taking place in Melbourne from 28th September to 3rd October this year. The Society is looking for one inspirational young farmer with an interest in Galloways plus one young supply chain partner, such as a young butcher or chef, who are keen to capitalise on the opportunity of a paid trip to the World Congress to see how Galloways are reared down under. The goal of the learning journey is to encourage an interest in Galloways and to add to the knowledge base of young Galloway farmers and supply chain partners in Scotland. 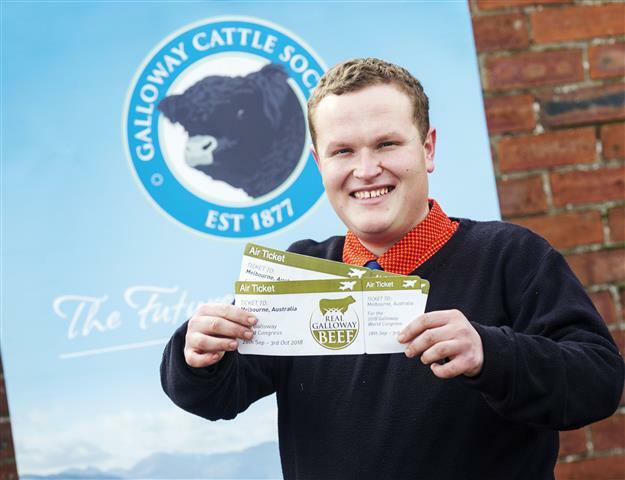 The learning journey is being run as part of the Society’s Defining Galloway Beef project during Scotland’s Year of Young People, and the project is part funded by Dumfries and Galloway’s LEADER programme. “Dumfries & Galloway might be the home of the Galloway but the popularity of the breed is global and we are keen to unlock that international learning and experience of this breed and bring it back to Scotland to inspire and educate young people within our industry. “It’s important that young farmers in our region don’t take for granted the fantastic attributes of Galloways, so to see the breed being valued and managed in different climates and landscapes is important in making sure we don’t lose sight of how important our own native cattle are. The learning journey is open to any young person aged between 18-30 years who is actively working within the farming or beef supply chain industries. Application forms are available from the Society who can be contacted on info@gallowaycattlesociety.co.uk. The trip is the second in a series of three international learning journeys designed to inspire and upskill farmers’ under 30 who have an interest in the Galloway breed. The first learning journey to the Denver Cattle Show earlier this year resulted in four young people with an interest in Galloways learning about US stock handling and meat grading. Candidates are invited between the age of 18 and 30 years old and is open to anyone interested in Galloway Cattle, retail or beef industry. 2 successful candidates, one from cattle industry and one retail/beef industry will be awarded flights, accommodation and congress fees. Applications will be assessed by a panel chosen by the GCS on their own merits and must have a cattle/beef industry element. Candidates must make themselves available to be interviewed in May by the said panel for selection of successful applicants. The successful applicants will be announced on at the Royal Highland Show on Thursday 21st June 2018. The successful applicants must provide a report within 4 weeks of attendance for use by the Society.